Okay. What can I say but..
And you never really grow out of Star Trek – especially the original series. 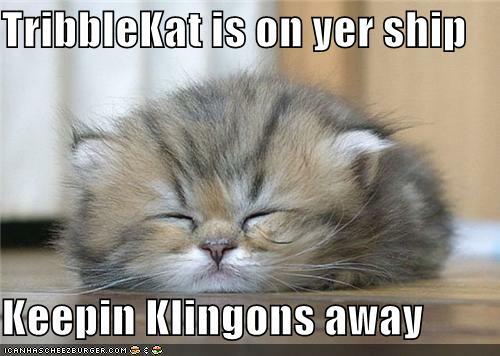 Tribbles have to be the cutest science fiction critter ever. And TribbleKat would be king (queen?) of the Tribbles! I kinda feel like I really have grown out of Star Trek, though I do enjoy the occasional re-watch with friends who are still really into it. Tribbles are fun critters, aren’t they? Grew…out…of Star Trek? What means this phrase? Yeah, yeah, I know. My geek buddies stare at me in disbelief whenever I say something like that. I thought it was great up to junior high, and I still like to re-watch episodes occasionally (like visiting old friends)…..but there’s more to scifi than combination ethical-dilemma-and-forehead-prosthesis-of-the-week…..
And right back atcha, Sky!